The Abbeville iris (Iris nelsonii) is a very special plant. It is the rarest of the so-called “Louisiana Irises” and can only be found growing naturally in one small swamp in southern Louisiana. If you are lucky, you can catch it in flower during a few short weeks in spring. The blooms come in a range of colors from reddish-purple to nearly brown, an impressive sight to see siting atop tall, slender stems. However, the most incredible aspect of the biology of this species is its origin. The Abbeville iris is the result of hybridization between not two but three different iris species. When I found out I would be heading to Louisiana in the spring of 2019, I made sure that seeing the Abbeville iris in person was near the top of my to-do list. How could a botany nut not want to see something so special? Iris nelsonii was only officially described as a species in 1966. Prior to that, many believed hybridization played a role in its origin. Multiple aspects of its anatomy appear intermediate between other native irises. It was not until proper molecular tests were done that the picture became clear. The Abbeville iris genome contains bits and pieces of three other irises native to Louisiana. The most obvious parent was yet another red-flowering species - the copper iris (Iris fulva). It also contained DNA from the Dixie iris (Iris hexagona) and the zig-zag iris (Iris brevicaulis). If you had a similar childhood as I did, then you may have learned in grade school biology class that hybrids are usually biological dead ends. They may exhibit lots of beneficial traits but, like mules, they are often sterile. Certainly this is frequently the case, especially for hybrid animals, however, more and more we are finding that hybridization has resulted in multiple legitimate speciation events, especially in plants. How exactly three species of iris managed to “come together” and produce a functional species like I. nelsonii is interesting to ponder. Its three parent species each prefers a different sort of habitat than the others. For instance, the copper iris is most often found in seasonally wet, shady bottomland hardwood forests as well as the occasional roadside ditch, whereas the Dixie iris is said to prefer more open habitats like wet prairies. In a few very specific locations, however, these types of habitats can be found within relatively short distances of eachother. Apparently at some point in the past, a few populations swapped pollen and the eventual result was a stable hybrid that would some day be named Iris nelsonii. As mentioned, this is a rare plant. Until it was introduced to other sites to ensure its ongoing existence in the wild, the Abbeville iris was only know to occur in any significant numbers at one single locality. This necessitates the question as to whether or not this “species” is truly unique in its ecology to warrant that status. It could very well be that that single locality just happens to produce a lot of one off hybrids. In reality, the Abbeville iris does seem to “behave” differently from any of its parental stock. For starters, it seems to perform best in habitats that are intermediate of its parental species. This alone has managed to isolate it enough to keep the Abbeville from being reabsorbed genetically by subsequent back-crossing with its parents. Another mechanism of isolation has to do with its pollinators. The Abbeville iris is intermediate in its floral morphology as well, which means that pollen placement may not readily occur when pollinators visit different iris species in succession. Also, being largely red in coloration, the Abbeville iris receives a lot of attention from hummingbirds. Although hummingbirds do not appear to show an initial preference when given the option to visit copper and Abbeville irises at a given location, research has found that once hummingbirds visit an Abbeville iris flower, they tend to stick to that species provided enough flowers are available. As such, the Abbeville iris likely gets the bulk of the attention from local hummingbirds while it is in bloom, ensuring that its pollen is being delivered to members of its own species and not any of its progenitors. For all intents and purposes, it would appear that this hybrid iris is behaving much like a true species. As with any rare plant, its ongoing survival in the wild is always cause for concern. Certainly Louisiana is no stranger to habitat loss and an ever-increasing human population coupled with climate change are ongoing threats to the Abbeville iris. Changes in the natural hydrologic cycle of its swampy habitat appears to have already caused a shift in its distribution. Whereas it historically could be found in abundance in the interior of the swamp, reductions in water levels have seen it move out of the swamp and into ditches where water levels remain a bit more stable year round. Also, if its habitat were to become more fragmented, the reproductive barriers that have maintained this unique species may degrade to the point in which it is absorbed back into an unstable hybrid mix with one or a couple of its parent species. Luckily for the Abbeville, offspring have been planted into at least one other location, which helps to reduce the likelihood of extinction due to a single isolated event. Many of you will undoubtedly be familiar with some variation of this evolutionary story: A population of one species becomes geographically isolated from another population of the same species. Over time, these two separate populations gradually evolve in response to environmental pressures in their respective habitats. After enough time has elapsed, gradual genetic changes result in reproductive isolation and eventually the formation of two new species. This is called allopatric speciation and countless examples of this exist in the real world. At the opposite end of this speciation spectrum is sympatric speciation. Under this scenario, physical isolation does not occur. Instead, through some other form of isolation, perhaps reproductive or phenological, a species gives rise to two new species despite still having contact. Examples of this in nature are far less common but various investigations have shown it is indeed possible. Despite its rarity, examples of sympatric speciation have nonetheless been found and one incredible example has occurred on a small oceanic island off the coast of Australia called Lord Howe Island. Lord Howe Island is relatively small, volcanic island that formed approximately 6.4–6.9 million years ago. It is home to four distinct species of palm trees from three different genera, all of which are endemic. Of these four different palms, two species, Howea belmoreana and Howea forsteriana, are quite common. Interestingly enough, H. forsteriana, commonly known as the kentia palm, is one of the most commonly grown houseplants in the entire world. However, their horticultural value is not the most interesting thing about these palms. What is most remarkable is how these two species arose. 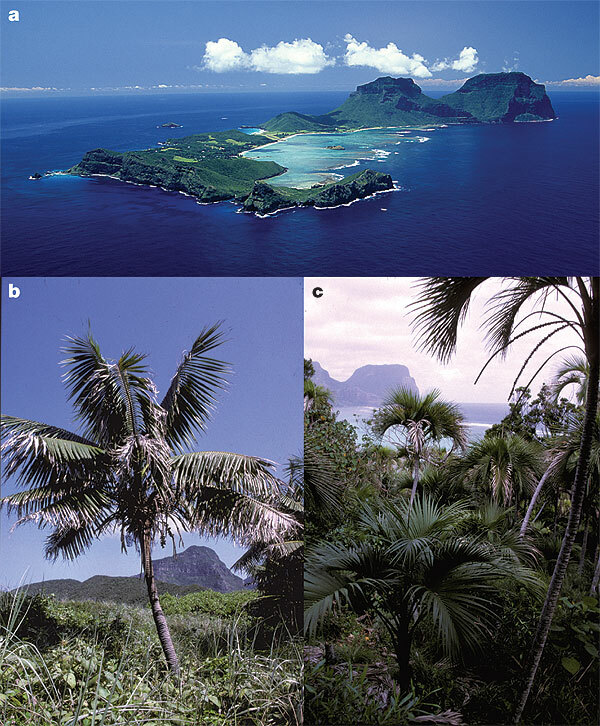 Multiple genetic analyses have reveled that both species originated on Lord Howe Island. This is kind of odd considering how small the island actually is. Both palms can regularly be found growing in the vicinity of one another so the big question here is what exactly drove the evolution of their common ancestor? How does a single species growing on a small, isolated island become two? The answer is quite surprising. When researchers took a closer look at the natural histories of these two species, they found that they were in a sense isolated from one another. The isolation is due to major phenological or timing differences in their reproductive efforts. H. forsteriana flowers roughly six weeks before H. belmoreana. Flowering time is certainly enough to drive a wedge between populations but the question that still needed answering was how do such phenological asynchronies occur, especially on an island with a land area less than 12 square kilometers? As it turns out, the answer all comes down to soil. Individuals of H. belmoreana are restricted to growing in neutral to acidic soils whereas H. forsteriana seems to prefer to grow in soils rich in calcarenite. These soils have a more basic pH and dominate the low lying areas of the island. Growing in calcarenite soils is stressful as they are poor in nutrients. This physiological stress has caused a shift in the way in which the flowers of H. forsteriana mature. When found growing on richer volcanic soils, the researchers noted that the flowers mature in a way that is more synchronous, not unlike the flowers of H. belmoreana. Thanks to their attention to detailed life history events and conditions, researchers were able to show that soil preferences caused a phenological shift in the flowering of these two related species. Because they flower at completely different times when growing on their respective soil types, enough reproductive isolation was introduced to disrupt the random mating process of these wind pollinated palms. As soon as such reproductive biases are introduced, speciation can and will occur. Ensuring that pollen from one flower makes it to another flower of that species is paramount to sexual reproduction in plants. It's one of the main drivers of the diversity in shapes, sizes, and colors we see in flowers across the globe. Sometimes the mechanism isn't so obvious. Take, for instance, the flowers of Impatiens frithii. The flowers of this Cameroonian endemic have been a bit of a puzzle since its discovery. Like all Impatiens, they have a long nectar spur. However, the spur on I. frithii is uniquely curved. This puzzled botanists because most of the Impatiens in this region are pollinated by sunbirds. The curved spur would appear to make accessing the nectar within quite difficult for a bird. Still, just because we can't imagine it, doesn't mean that it's impossible. Something must pollinate this lovely little epiphyte in one way or another. This is where close observation comes in handy. Thanks to remote cameras and lots of patience, botanists were able to record pollination events. They quickly realized that sunbirds are indeed the primary pollinator of this species. This was a bit of a surprise given the shape of the flower. However, the way in which the flowers deposit pollen on this birds is what is most remarkable. As it turns out, successful reproduction in I. frithii all comes down to that curved nectar spur. When a sunbird probes the flower for nectar, its beak follows the contour of the spur and this causes the entire flower to twist. As it twists, the anthers and stigma make contact with the chin of the bird. This is unlike other Impatiens which deposit the pollen on top of the heads of visiting birds. Such an adaptation is quite remarkable in many ways. For one, it is elegantly simple. Such a small alteration of floral architecture is all that is required. Second, by placing pollen on the underside of the head, the plant guarantees that only pollen from its species will ever come into contact with the stigma. This is what we call reproductive isolation, which is an important driver in speciation. I would like to tell you a tale that involves three major players, the pine squirrel, crossbills, and lodgepole pines. The tale I am about to tell is an interesting one about speciation due to coevolution. Few examples in nature seem to play out so wonderfully apparent as this one. Throughout most of the Rockies where lodgepole pines grow, the main seed predator is the pine squirrel. Crossbills are out-competed for this resource wherever the squirrels are present. Because of this, lodgepole pine cones have evolved methods to deter squirrel seed predation as much as possible. In Idaho, there are a few isolated mountain tops that have lodgepole pines but no pine squirrels. On these mountains, crossbills are the main seed predator and the pines have responded accordingly. Crossbills are named because their bills are crisscrossed so that they can pry open the cone scales to get at the seeds. The trees in these isolated mountains have developed stouter cones with thicker scales that are harder to pry apart. The birds have responded by evolving shorter, deeper bills. The most interesting thing about this response is the effect the new bill morphology has had on mating dynamics for the crossbills on these isolated mountains. Crossbills utilize calls to select mates. Also, crossbills prefer to flock with other crossbills that have similar calls. This is because beak morphology directly affects calls so by flocking with birds with the same call, crossbills can guarantee that the flock will find food sources that they can all utilize. As beak morphology changes, so does the sound of the calls. It has been shown that the crossbills on these isolated mountains are showing preference for mating only with crossbills with the same bill morphology. Also, because they are the only crossbills that can utilize these lodgepole pines, they are one of the few crossbill populations that can stay in an area instead of migrating large distances to find other food sources. These pre-mating isolation rituals are so strong on these mountains that the resident crossbills rarely mate with crossbills migrating through in search of food. In essence, the coevolution between these isolated lodgepole pine populations and the resident crossbills is driving these birds towards speciation. Whats more, this coevultion is estimated to have arisen only about 5,000 to 7,000 years ago. On a side note, this may be a world record for how many times the word "crossbill" can find its way into a story.